Radio Flyer Classic Tricycle With Push Handle Just $41.99! Down From $90! PLUS FREE Shipping! You are here: Home / Great Deals / Amazon Deals / Radio Flyer Classic Tricycle With Push Handle Just $41.99! Down From $90! PLUS FREE Shipping! Calling all Prime Members! Amazon is currently offering the Radio Flyer Classic Tricycle With Push Handle for just $41.99 down from $89.99 PLUS FREE shipping! 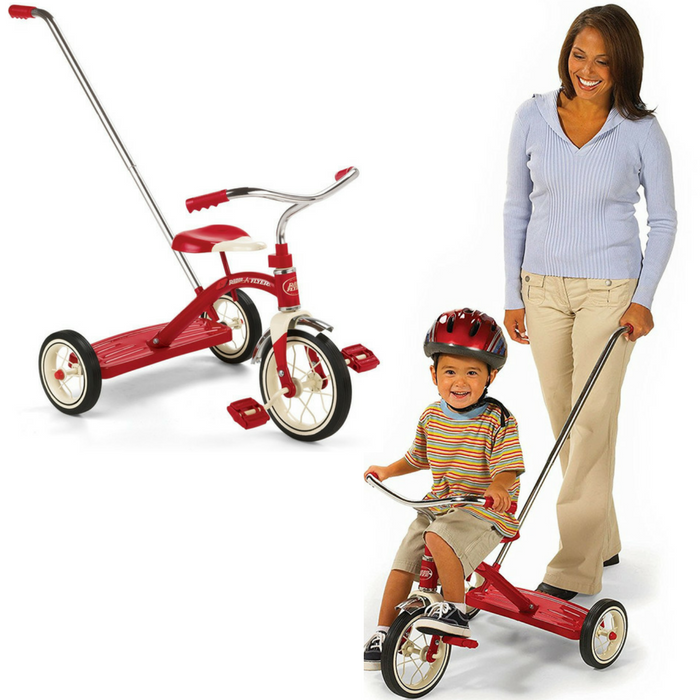 The Radio Flyer Classic Red Tricycle with Push Handle is great for going to parks or around the neighborhood. The removable 3-position adjustable handle helps guide your child’s ride. This sturdy trike also features steel construction, durable spoked wheels, a 10” front wheel and real rubber tires. The controlled turning radius prevents tipping for safe and confident riding. This bright red tricycle is classically styled and includes chrome handlebars and fender. The adjustable seat grows with your child.